Comodo Cloud Antivirus is a powerful antivirus software that was designed to keep your PC safe against the large number of security threats that continues to grow day by day. The application is extremely easy to configure and use, although it doesn’t compromise on security. The program bundles a rich set of options, which are easy to understand for those with little technical experience. With Comodo Cloud Antivirus, your PC can benefit from enhanced security through real-time protection. Furthermore, the antivirus scan module provides four types of scans: full, quick, file or folder scans. The program allows you to safely run suspicious applications in a secure and isolated environment as it includes sandbox protection modules for this purpose. You can edit the sandbox feature from the program’s settings so it will automatically sandbox all untrusted applications or simply display pop-up notifications. 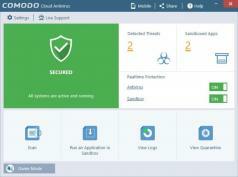 What’s more, Comodo Cloud Antivirus lets you enable and disable the Viruscope and sandbox modules as needed.